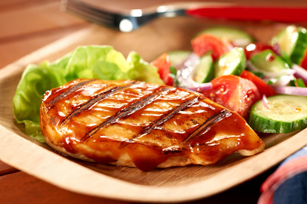 Kraft Kitchens share their secrets to grilling perfectly moist, juicy chicken this summer. This ultimate, no-fail recipe will delight everyone around your table. 1. PLACE chicken on cutting board and use a kitchen mallet, rolling pin or small sauce pot to slightly flatten any thick ends. This step ensures even width and even cooking. 2. POUR dressing into a large resealable plastic bag. 3. PLACE chicken in bag with dressing. Seal bag and refrigerate 30 min. to 1 hour to marinate. 4. PREHEAT barbecue to medium heat. Remove chicken from plastic bag and discard marinade. Place chicken on barbecue; cover with lid. Grill 6 to 8 min. on each side or until cooked through. 5. BRUSH with barbecue sauce during last few minutes of grilling time.